Herniated Discs in the Thoracic region are relatively uncommon compared to the Cervical or Lumbar regions. The incidence in the USA is approximately is 1 in 1 million individuals per year with the Thoracic level accounting for 0.25-0.75% of all Disc Herniations. The Thoracic Spine is considered to be a more stable structure (compared to the Cervical and Lumbar regions) as a result of the connections of the Sternum (in the front of the Chest) and the Ribs which articulate with each Thoracic Vertebra. This stability also translates to the projected natural history of Herniated Thoracic Discs which are also unusually stable compared to Herniated Cervical and Lumbar Discs. The Thoracic Spine's Facet Joint structure is different from the other Spinal Regions. In the Thoracic Spine these Facet Joints are vertical with a slight medial angulation which allows for easier side bending and rotation WHILE LIMITING FORWARD BENDING. Biomechanical experiments have demonstrated that Intervertebral Discs, are at highest risk of injury when subjected to a combination of FORWARD BENDING and TWISTING forces. Therefore, the risk of injury to the Thoracic Spine's Discs is considerably less due to the limited FORWARD bending potential in this segment of the Spine. THERE ARE FIVE (5) ANATOMICAL FACTS THAT RENDER THE THORACIC SPINAL CORD AT HIGHER RISK TO INJURY. HIGHER SPINAL CORD/SPINAL CANAL RATIO. The Thoracic region's Spinal Cord-to-Spinal Canal ratio is 40% whereas the Cervical Spine's ratio is 25%. In other words, the THORACIC SPINAL CORD OCCUPIES MORE SPACE WITHIN THE SPINAL CANAL LEAVING SUBSTANTIALLY LESS ROOM FOR ANY OTHER STRUCTURE (MASS LESIONS) SUCH AS A HERNIATED DISC OR TUMOR. THORACIC SPINE "CURVATURE". The Thoracic Spine has a normal curve (called "kyphosis") which places the Spinal Cord in close proximity to the Posterior Longitudinal Ligament (a critically important structure that runs vertically along the back of each Vertebral Body), the posterior aspects of the Vertebral Bodies and the Disks. As the Spinal Cord "bends" over this curve it is more susceptible to compression from Disc Herniation. TENUOUS BLOOD SUPPLY. The blood supply of the Thoracic Spinal Cord is derived from arteries that originate in the Cervical and lower Thoracic levels. As a consequence the Thoracic Spinal Cord's arterial blood supply is more tenuous than the Cervical and Lumbar levels, particularly at the T4-T9 "watershed area" (the area furthest away from each of the main arteries), which is more prone to ischemic injury. INTRADURAL LIGAMENTS. 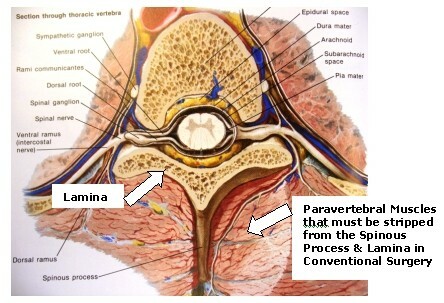 The Intradural "dentate" ligaments (situated between the Spinal Cord and the Dura Mater) restrict posterior movement of the Spinal Cord within the Spinal Canal which restricts the Thoracic Spinal Cord's ability to "move away" from a "mass lesion" in front of the Spinal Canal such as from a Herniated Disc, Bone Spur and/or Calcified Posterior Longitudinal Ligament. CALCIFICATION OF THORACIC HERNIATED DISCS. "Calcification" is a common finding in Thoracic Herniated Discs, particularly in those patients where the Discs herniated as a result of "degeneration". This "calcification" often involves the Posterior Longitudinal Ligament as part of the "degenerative" process. The presence and extent of calcification can create substantially more pressure upon the Spinal Cord. Herniated Thoracic Disc (particularly involving the lower Thoracic levels) patients usually experience symptoms similar to individuals with Lumbar Disc Herniations which can make accurate anatomical diagnosis difficult. PAIN: Pain is the most common symptom (60%) in Herniated Thoracic Disc patients. The quality and location of the pain depend on the location of the Disc pathology and whether Neural Elements (Spinal Cord & Nerve Roots) have been compressed and/or injured. Purely "discogenic" pain may be experienced as dull and localized to the Thoracic Spine. Herniated Discs in the Upper Thoracic Spine are very uncommon with the pain mimicking that of Cervical Herniated Discs; whereas, Herniated Discs in the Lower Thoracic levels may be confused as Lumbar level pain. Even more confusing from a diagnostic point of view is the fact that the pain associated with Herniated Thoracic Discs may also be "referred" to the other areas such as the Chest, Abdomen, Groin and Flank regions. As a consequence, the initial medical investigations may lead to evaluations of Heart, Lung, Stomach, Pancreas, Gall Bladder, Hernia and Kidney diseases. The pain usually begins rather insidiously, without any history of a significant preceding trauma and then progresses to either Radiculopathy (due to Nerve Root compression) and/or Myelopathy due to Spinal Cord compression. When a Herniated Thoracic Disc compresses a Thoracic Nerve Root, the patient is likely to experience pain in the distribution pattern of that Nerve Root which is often band-like, traversing the Anterior Chest Wall. This pain is usually described as electric, burning, or shooting in nature and may be intermittent or constant. On the other hand, when Spinal Cord compression and Myelopathy are present, the pain may be experienced in any dermatome distal to the site of compression. MOTOR DEFICIT: Weakness in one or both lower extremities is a serious problem, the presence of which requires early and thorough Neurological investigation lest a potentially correctable problem is overlooked and the patient subjected to life-long paralysis. The motor nerves of the Thoracic Spinal segments supply the Abdominal and Intercostal Muscles. Although weakness of these muscles may occur, it is unlikely to be an early presenting symptom and usually one that is difficult for the patient and the examining physician to recognize. BLADDER SYMPTOMS: Urinary Bladder control problems resulting in incontinence are rare as the presenting symptom. However, bladder symptoms are fairly common when Spinal Cord compression and Myelopathy have occurred. These patients may have bowel incontinence as well. The presence of these symptoms elevates the situation to an urgent one. SENSORY PROBLEMS: Sensory disturbances may be the presenting symptom in 25% of these patients with the sensation of "Numbness" being the most common experience. Other sensory complaints include the presence of disagreeably altered sensations (dysesthesias) and tingling (paresthesias) in a Nerve Root pattern (dermatomal distribution.) Not all patients experience "sensory disturbances"; however, when present, they are highly suggestive of the diagnosis of a Herniated Thoracic Disc. When sensory disturbances occur over a wider distribution below the suspected Herniated Thoracic Disc, it more is consistent with Myelopathy due to Spinal Cord compression and is regarded as a more serious neurological condition. BROWN-SEQUARD SYNDROME: The Brown- S�quard Syndrome is an unusual constellation of Motor and Sensory disturbances resulting from a Central-lateral Intraspinal "Mass Lesion". It consists of "Ipsilateral" weakness (on the same side as the "mass") and "Contralateral" (on the opposite side of the "mass") pain and sensory disturbances. In the case of a Herniated Thoracic Disc, this Syndrome is more likely to occur in younger patients who have a more definite history of trauma. Accurate Neuroimaging is imperative in order to identify the critical anatomical issues related to Herniated Thoracic Discs. High quality MRI Scans may provide sufficient detail for diagnostic and therapeutic decision making. In cases where there is concern for a "Calcified" Herniated Disc and/or Posterior Longitudinal Ligament, a CT Scan (usually occurring as part of a Myelogram Study) may be required. Figure 1B (Right): Non-contrast MRI Scan (Axial View-Same Patient). The centrally Herniated Disc (Arrow) appears to occupy more than � of the Spinal Canal Diameter. Figure 2C (Right): CT Scan (Axial View-Same Patient) The Neuroradiologist has measured the diameters of this "mass" as 9.80 millimeters X 6.79 millimeters, a LARGE INTRASPINAL LESION. Conservative (bed rest) treatment along with "pain control" is often quite effective in the early stages for many patients since the PROCESS OF A HERNIATED THORACIC DISC TENDS TO BE SELF-LIMITING AND RARELY REQUIRES SURGICAL INTERVENTION. INTRASPINAL INJECTIONS OF STEROIDS SHOULD BE AVOIDED DUE TO THE RISK OF INJURY TO THE SPINAL CORD AND/OR NERVE ROOTS AND CANNOT, IN ANY WAY, AFFECT THE HERNIATED DISC. Physical Therapy is of limited usefulness in cases of Herniated Thoracic Disc. However, once the pain has subsided and THERE ARE NO SIGNS OR SYMPTOMS OF MOTOR DISTURBANCES, a well designed and medically supervised Physical Therapy program can offer ways to control symptoms by improving mobility and posture. Therapy sessions are often scheduled two to three times each week for up to six weeks. Learn ways to manage their condition and control the symptoms. Learn correct posture and body movements to reduce back strain and reduce the risk of recurrence of the problem. Identify the signs and symptoms of Thoracic Disc Herniation that require medical attention. Figure 3A (Left): Non-contrast MRI Scan (Sagittal View) Multi-level Herniated Thoracic Discs (Arrows) in a 58 year old Female complaining of Thoracic level "back pain". 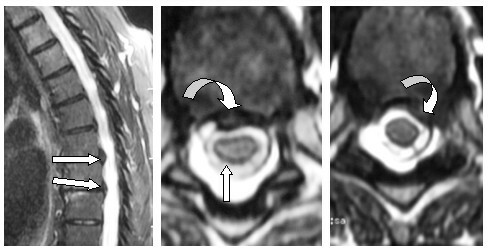 Figure 3B (Center): Non-contrast MRI Scan (Axial View-Same Patient) The Herniated Thoracic Disc (Curved Arrow) corresponds to the Upper one in Figure 3A. It appears to have slightly "indented" the Spinal Cord on the Patient's Right side (the left side of this picture). However, there is considerable Cerebrospinal Fluid (CSF-indicated by the Vertical Arrow) surrounding the Spinal Cord in a fairly large Spinal Canal. NOTE: THIS PATIENT DID NOT HAVE ANY NEUROLOGICAL DEFICITS. HER PAIN WAS WELL CONTROLLED WITH A SHORT COURSE OF BED REST FOLLOWED BY REDUCED ACTIVITIES FOR SEVERAL MONTHS. PHYSICAL THERAPY TAUGHT HER PROPER "BODY MECHANICS". SHE SUCCESSFULLY AVOIDED ANY SURGICAL INTERVENTION AND REMAINS FREE OF PAIN. Surgery for removal of a Herniated Thoracic Disc is often a technically more difficult procedure compared with the Lumbar or Cervical Regions. The limited space available within the Spinal Canal and the limited tolerance of the Spinal Cord to any "manipulation" coupled with the Spinal Cord's relatively tenuous blood supply increase the susceptibility of the Spinal Cord to injury during any operation. The likelihood of favorable outcomes is increased depending on the surgical skills of a competent surgeon using advanced Neurosurgical Techniques in carefully selected patients. While there are no strict evidence-based indications for the surgical management of patients with a Herniated Thoracic Disc, there appears to be general agreement that surgery is indicated when signs of Spinal Cord compromise (Myelopathy) are present. Early surgical intervention is important in these Myelopathic patients since the rate of recovery diminishes when more advanced neurological deficits are present. The indications for surgery in cases of Thoracic Radiculopathy are less clear because many patients respond to "conservative management". In patients where the pain associated with Nerve Root compression fails to resolve and becomes severe, then surgery is likely to be quite rewarding. PATIENTS EXPERIENCING PURELY DISCOGENIC PAIN AND/OR "AXIAL" PAIN ARE NOT REGARDED AS SURGICAL CANDIDATES BY MOST ETHICAL SURGEONS. While there are many surgical approaches that can be used to remove a Herniated Thoracic Disc, time and considerable historical experience has proven that the earliest operation (a Posterior "Decompressive" Laminectomy) produced poor results including unacceptable complication rates. The approaches from the "Anterior" (front) require the surgical management of the Lung as well as some of the "Great Vessels" of the Thorax (such as the Aorta and Inferior Vena Cava), all of which adds serious risks beyond that which is inherent to the management of the Herniated Disc and the Spinal Cord. The term applied to one of these operations is "VATS - Video Assisted Thoracic Surgery" which uses three or four incisions in the Chest Wall for the introduction of relatively large Endoscopic instruments. THE MORTALITY AND MORBIDITY RATES FOR THESE "ANTERIOR" PROCEDURES (PARTICULARLY "VATS") APPEAR TO BE UNDER-REPORTED. ANYONE CONTEMPLATING UNDERGOING THE OPERATION IS ADVISED TO SEEK ANOTHER OPINION AND TO INQUIRE INTO THE REAL COMPLICATION RATES FOR THAT SURGEON. IN OUR EXPERIENCE, THIS MINIMALLY INVASIVE MICROENDOSCOPIC PROCEDURE IS THE SAFEST, MOST ACCURATE AND MOST EFFECTIVE OF ALL MODERN SURGICAL TECHNIQUES DESIGNED TO TREAT HERNIATED THORACIC DISC PATIENTS. A STANDARD LAMINECTOMY REQUIRES THE REMOVAL OF THESE MUSCLES ON BOTH SIDES OF THE SPINAL COLUMN WHEREAS MINIMALLY INVASIVE SURGERY SPARES THESE MUSCLES. The Paravertebral Muscles remain intact as the special Minimally Invasive "Tube Retractor" separates and preserves the muscles fibres. In this illustration, the Lamina on the side of the tube Retractor has been removed (Bi-directional Arrow). The retractor was then angled towards the opposite side allowing the surgeon to drill and remove the Lamina (small Bi-directional Arrow) on the OPPOSITE SIDE. 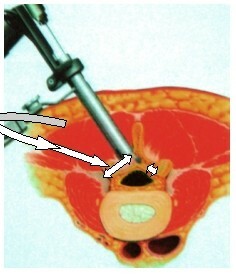 The drilling is accomplished within the Epidural Space which requires considerable technical skill. The muscles on the "Opposite" side are never disturbed. In our experience the tube retractor must be "angled" more severely (as indicated by the Curved Arrow) to permit a "Low Trajectory" (indicated by the Straight Arrow) approach to the Anterior aspect of the Thoracic Spinal Canal. This surgical exposure has proved to be excellent for the removal of Spinal Cord Tumors as well as Herniated Thoracic Discs. Figure 6A (Left): Post-myelographic CT Scan (Sagittal View-Same Patient as Figures 1 & 2). 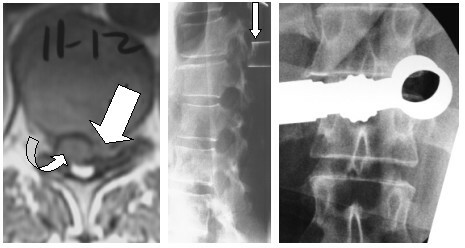 This is a large "Calcified" T12-L1 Herniated Disc ((Horizontal Arrow) that displaces and compresses the Spinal Cord (represented by the dark vertically oriented, "Arrow-shaped" structure within the Spinal Canal-Curved Arrow). The "bright white" material is the "myelographic dye" that mixes with and represents the Cerebrospinal Fluid surrounding the Spinal Cord. Figure 6B (Center) & Figure 6C (Right): Intra-operative X-rays demonstrating the precise location of the Minimally Invasive Tube Retractor used in this case. A LEFT-SIDED COSTOTRANSVERSECTOMY WITH BILATERAL T-12 & L1 LAMINECTOMIES WAS USED IN THIS PATIENT SINCE THE HERNIATED DISC WAS SLIGHTLY ECCENTRICALLY LOCATED TO THE LEFT (See Figures 2B & 2C.) THE CALCIFIED POSTERIOR LONGITUDINAL LIGAMENT AND THE "CALCIFIED DISC" WERE REMOVED WITHOUT UNDUE DIFFICULTY. THIS PATIENT WAS KEPT OVERNIGHT IN THE NEUROLOGICAL INTENSIVE CARE UNIT AND WAS DISCHARGED ON THE 2nd POST-OPERATIVE MORNING. HER SEVERE PRE-OPERATIVE INCAPACITATING PAIN WAS IMMEDIATELY RELIEVED. WHEREAS PRE-OPERATIVELY SHE WAS CONFINED TO A WHEEL-CHAIR, POST-OPERATIVELY, SHE BEGAN TO WALK WITHIN HOURS OF THE OPERATION. IT COMMONLY TAKES SEVERAL MONTHS TO ACHIEVE THE MAXIMUM NEUROLOGICAL RECOVERY IN A PATIENT WITH SUCH SEVERE DEFICITS. 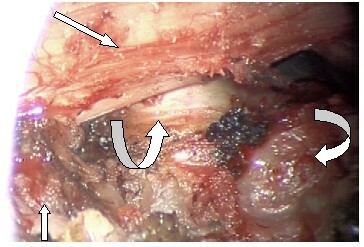 A Minimally Invasive Left-sided approach demonstrates the T12 Nerve Root (Small Vertical Arrow in Lower Left of this photo), the Dura Mater overlying the Spinal Cord (Oblique Straight Arrow), the bulging, calcified Posterior Longitudinal Ligament (Up-curved Arrow) and part of the Extruded Degenerative & "Calcified" Disc (Left-curved Arrow). 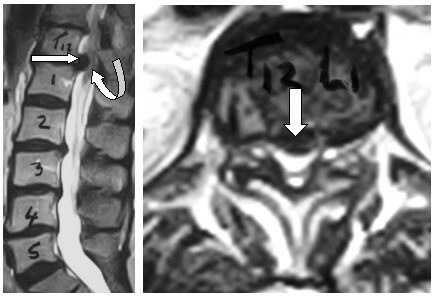 Figure 8A (Left): Non-contrast MRI Scan demonstrating a large Far Left Lateral Herniated Thoracic Disc (Wide Oblique Arrow) at the T11-T12 level. The Nerve Root is compressed and the Spinal Cord (Curved Arrow) is displaced to the opposite (Patient's RIGHT) side of the Spinal Canal. Figure 8B (Center) & 8C (Right): Intra-operative X-rays (Same Patient) demonstrating the precise location at T11-T12 of the 18 millimeter Minimally Invasive Tube Retractor used in this case. Figure 9: Operative Photo (Same Patient as in Figure 8). A Minimally Invasive Left Costotransversectomy, Bilateral T11 & T12 Laminectomy (Unilateral Approach) was accomplished using an 18 millimeter diameter retractor Tube. The large Herniated Lateral Disc (Up-curved Arrow) can be seen just "below" the edge of the Dura Mater (Left-pointing Oblique Arrow). 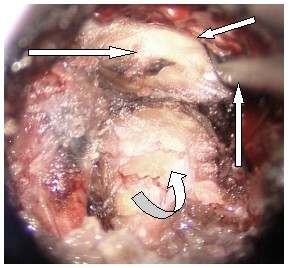 A sharp microsurgical instrument (Vertical Arrow) is being used to separate the Dura from the posteriorly displaced Posterior Longitudinal Ligament (Slender Horizontal Arrow). DISCLAIMER: Every effort has been made by the author (s) to provide accurate and up-to-date information. However, the medical knowledge base is dynamic and errors can occur. By using the information contained herein, the viewer willingly assumes all risks in connection with such use. Neither the author nor Neurosurgical Consultants, p.a. shall be held responsible for errors, omissions in information herein nor liable for any special, consequential, or exemplary damages resulting, in whole or in part, from any viewer(s)' use of or reliance upon, this material. CLINICAL DISCLAIMER: Clinical information is provided for educational purposes and not as a medical or professional service. Person(s) who are not medical professionals should have clinical information reviewed and interpreted or applied only by the appropriate health professional(s). All content ©2019 by Neurosurgical Consultants, P.A. All Rights Reserved. See Usage Notices. What is Neurological Surgery & why is it necessary? Why choose a Neurosurgeon for Spine Care? What is Minimally Invasive & Endoscopic Neurosurgery? What is Skull Base Tumor Surgery? What should you expect of your Neurosurgeon? Whom does my Neurosurgeon work with? What should I expect from the hospital facility? How can I be a part of the decision-making process? I call my General Physician? What should I know about my recovery? What forms might I need?